ADI Part 3 is to test your ability to teach. The test lasts for one hour and is divided into two 30 minute segments. The examiner can choose from 10 Pre-Set Tests (PST). Each PST has two phases. If for example the examiner chooses PST 3, phase 1 will be the examiner playing the role of a pupil and you will need to teach him the turn in the road. In this phase the examiner will have little driving experience, but enough driving ability to drive to the location where the turn in the road will be taught. For PST 3 phase 2, the examiner will have a much higher driving ability and will play the role of a pupil where he will need to be taught Approaching Junctions. Which ever PST the examiner chooses, during both phase 1 and 2, he or she will be making plenty of mistakes and asking questions to test your ability to teach. Based on the PST the driving examiner has chosen, he or she will expect you to provide a lesson briefing if required and explain what you hope to achieve this lesson. During the practical part of the PST, verbal support will be expected to provide help. Each 30 minute phase will be graded from 1 to 6, with grade 4 and above being a pass. The minimum you need to pass Part 3 is a 4/4 on each 30 minute part. Grade 4 is adequate, grade 5 is good and grade 6 is excellent. The Part 3 ADI test is to assess your ability to teach. Throughout the test, the examiner will play the role of a pupil in which you will need to teach certain aspects of driving. The Part 3 test lasts for one hour and is divided into two phases. Phase one assesses your ability to teach a novice or intermediate learner and phase two assesses your ability to teach learners with a much higher ability to drive. The examiner plays the part of a novice or intermediate learner driver in phase one and in the second phase he or she will play the part of a learner who is approaching test standard. The examiner will choose one out of ten Pre-Set Tests (PST). You can score from grade 1 to 6. A grade 4 or above must be scored in each phase in order to pass Part 3. Three attempts are permitted at Part 3. Failure of all 3 attempts will result in having to wait 2 years from the date you passed your Part 1 test before you can start again. In this situation, ADI Part 1, ADI Part 2and ADI Part 3 will then have to be taken again. Below you will find some of the more important areas of advice to keep in mind when taking your ADI Part 3 test. 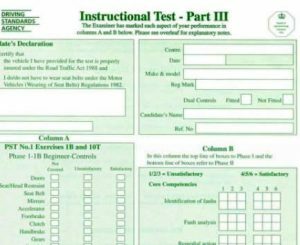 The DVSA ADI 1 document explains the rules that the examiner must abide by for the Part 3 test. A read of this may provide you with some insight and useful tips for passing your Part 3 test. Once Part 2 has been passed and you have completed 40 hours of ADI Part 3 training, you may want to consider applying for a trainee driving instructor licence. If the trainee licence is granted it will enable you to instruct for a maximum of 6 months for pay. The experience gained in these 6 months will help enormously towards aiding you in the Part 3 test. It is not essential to become a trainee driving instructor (PDI), but If you believe you are struggling with your Part 3 training or your trainer recommends that becoming a PDI will benefit you, it then may be in your interest to apply for one. Generally only one trainee licence is permitted, although in certain circumstances a second can be granted. Take time to learn the roads and routes around the test centre. In particular the more complicated parts such as one way systems or difficult roundabouts. This will help immensely in your test for If you happen to use these routes in your Part 3 test then it will provide you with a much better understanding of what is approaching. This will allow you to relay instruction to the examiner in good time. At the start of your ADI Part 3 test, the examiner will give you a ‘word picture’. This word picture determines the role that the examiner will be playing. For example, the examiner will play a learner with very little experience and the PST he has chosen will be teaching the 3 point turn. Obviously you will be nervous on your test and it may go in one ear and out the other. Not understanding the word picture due to nerves is a common reason for failure. Listen to the word picture very carefully and if you do not quite understand, then ask to repeat. After your word picture, well thought questions to the examiner is important. By covering these thoroughly, you may well discover some mistakes the examiner will make even before you set off. During your ADI Part 3 test, one of the most important aspects of your training is your Part 2. If at any point the examiner does something that you yourself would not have done in your Part 2, then it is not acceptable. Use your Part 2 training to its fullest. The skills you gained on your Part 2 training is by far the most important knowledge needed to pass Part 3. Your ultimate goal is for your pupil (the examiner) to drive safely, with good control and abiding by the rules of the road just as you did when you passed your Part 2. Keep control of the situation. The examiner at any given time will make error after error and they will come thick and fast if you let him. These errors escalate quickly and before you know it, all control is lost. The moment you see an error, pull the examiner up on it. If the errors are coming in fast then ask the examiner to pull up on the left, making sure it is a safe convenient and legal position (SCALP). By doing so, you can address the errors he or she has made, analyse them and more importantly, you have regained control. This is quite a common technique examiners use. So be prepared for that one. Another technique the examiner may use at the same time as making errors is to ask you questions that really aren’t relevant to the task at hand. This is simply another technique used to see if you can keep control. Don’t be afraid to step in and tell the examiner that you will address those questions at a later time but for now all concentration must be given to the task at hand. It is important to know your Pre-Set Tests (PST) within reason but not to over do it. A experienced and high quality driving instructor trainer will teach you how to instruct and not follow a routine. Studying your PST to a fine routine can potentially lead to failure. Any given situation can lead to a different approach to your teaching method. During the Part 3 test, the examiner has a vast array of mistakes and errors that he or she can produce. The weather can play a part, if it’s raining for example, this could provoke the examiner into produce errors that are related to wet roads. Even the time of day can play a part. If there is significant traffic, it can play a part in the mistakes the examiner plays. Try not to be too linear in your teaching methods. Be prepared to change these at any given moment. You should be taught how to remain calm under pressure and keep in control. How to diagnose problems and faults with good questions and answers, spot faults on the move, analyse the fault so you can understand why the pupil has done this and explain the fault to the pupil, why it is incorrect or potentially dangerous and how it should be corrected. The faults should be remedied with clear instructions on every aspect and with the use of reference points if possible. The examiner isn’t interested in a set routine. He or she will be demonstrating to you that all your pupils will be different and will make entirely different and at times unexpected mistakes. Some will be very nervous and some will be far too confident. With this in mind, studying your PST to a routine simply will not work. Being prepared to change your course of action at any given time, identify, analyse and correct faults based on your Part 2 skills is essential. There are many training establishments that will teach Part 1, 2 and of course ADI Part 3. It’s important to use a trainer that you feel comfortable with and one that you clearly understand their teaching methods and instructions. An ORDIT registered trainer doesn’t necessarily mean they are good, it simply means they follow a particular criteria set out by the DVSA. You may find a local independent ADI trainer better as they are more likely to offer a 1 to 1 service with a more personal approach. You may find this to be cheaper also. ADI Part 3 training can be expensive, so try to judge your decisions initially on recommendations and reviews. Before signing up to an entire course, meet your trainer first and ask to have a short introductory assessment lesson. This will enable you to see if you get along and understand them clearly, which is important. Ask also if it is the same trainer throughout the entire course as it’s beneficial that it is. Sharing the vehicle with other trainee driving instructors has it’s advantages as you can learn from others mistakes. Make sure however that if there is sharing, ensure you are guaranteed an amount of actual behind the wheel training yourself.